For me it was totally natural to make a film that puts into perspective the development of Quebec’s energy through a canoe trip. This is the best way to approach the area for filming. Crossing the ecosystem slowly at the speed of the paddle we can become more aware of the territory. With this film, we wanted the audience to sit with us in the boat in a wild and virtually untouched ecosystem. A wild place as there are less and less in our world. Because of our lifestyle but also because of the fact that in Quebec the politicians see only hydropower to meet our needsa fully developed energy from the grandiose nationalization of electricity in 1962. Seeking the Current is not only a film that challenges the decisions of the state-owned Hydro Quebec. It also asks how to generate renewable energy in Quebec. Everyone is concerned: the mayor of the village, the Prime Minister, citizens, officials, scientists, engineers, business people, young and old. If we want to develop the world, create long-term jobs for each region and build a society that builds with the strengths of the past without remaining stuck there, we have to consider the ideas humbly expressed in this film. I really hope they feed into the reflections of everybody. I was immediately grasped by this project as it combines my great passions for adventure, nature, reflexion and film. We left like I never did before: 712 km by canoe, including 212 km against the current, 46 days on the waterways in the middle of the bears and the taiga. But the adventure was not confined at the far end of the wood. At the end of the Romaine River, we embarked on an expedition to explore the renewable energy possibilities: biomass, biogas, geothermal, solar, wind, energy efficiency. The more we dug in, the more it became obvious: other energy sources exist, their technology is mature and some are more profitable than the Romaine hydropower. Yet they are left in the shadows … Why? Gradually, we realized, Nicolas and me, that there was an urgency to communicate what we gathered After searching the river current and the current renewable energy possibilites, we realized that there was a third level under our film: try to make people aware, share knowledge encountered during our endeavour. In the summer of 2007, Nicolas and Alexis came to Productions du Rapide-Blanc with an interesting idea for a film. They were going to paddle 200km upstream on rivers and reservoirs, in search of the Romaine River’s source. Once found, they would canoe 500km south, the full length of the river and exit at its mouth in the St. Lawrence. Their impetus was the environmental impact study that Hydro-Québec had released in conjunction with their impending 4-dam hydroelectric project on the Romaine river. After descending the river, Nicolas and Alexis’ explained, they would investigate various green energies in comparison to what we were doing with large hydro plants. Essentially, they wondered Could we be creating energy differently in Quebec? From the project’s inception, our goal was to offer solutions, not just criticize. 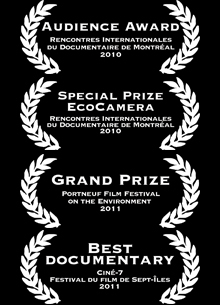 We wanted the film to document the Romaine’s ecosystem and explore the financial viability of green energies in Quebec. We wanted the film to offer the public information and a view they rarely hear, supported with solid facts and in an entertaining way. Our goal was to produce a film that would contribute to and encourage others to get involved in a healthy debate about the future of energy production in the province of Quebec. 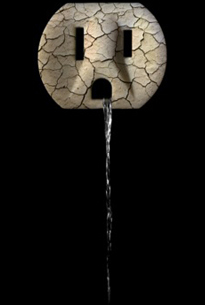 Hydro-Québec’s point of view is presented through the various documents we consulted and cite throughout the film, but it is important to note that Hydro-Québec refused all our requests to be interviewed. We wrote, we called (repeatedly), we even approached them in person during the BAPE (Bureau d’Audiences Publique sur l’Environnement) public hearings in Havre-Saint-Pierre. Nothing. Instead of engaging with us about their Romaine project, they remained silent. Now that the film is generating publicity, they have issued press releases that skirt the facts of the film. We address every one of their points here. L’ensemble de nos échanges est disponible ICI.